Mick Sell Racing :: Five winners from Five starters! Five winners from Five starters! KYNETON trainer Mick Sell didn't expect to take five horses to his local track on Australia Day and come home with five winners. But then he didn't expect his wife to give birth beside Tullamarine Freeway 12 days earlier, either. Not surprisingly, people started to wonder after Mick bagged the five that little Louise, born underneath the Melbourne Zoo exit sign, might be her old man's lucky charm. "Yeah, we've had a few people offer to buy her," Louise's mum, Mel, said. Mick and Mel Sell's gigantic January took its first dramatic turn when Mel started having contractions about five o'clock on January 14. Mick was at Flemington races with Enchanting Waters, which had run fifth. Mel and her mate Julie Burgess watched the race then set off for the Royal Women's, where her kids Sarah, 8, and Joe, 5, had been born. As Mel and Julie approached the zoo exit, Mel's contractions worsened and Julie pulled over. Mick, just a few kilometres away, was leaving the track. "Julie delivered the first half of Louise's body, the paramedics the second half," Mel said. "It was all over in 10 minutes. "She flew out. I rang Mick, asked him where he was, and told him he had a baby girl." Mick, who had bailed out of his car and bolted up the Bulla exit ramp to meet Julie's parents, who'd similarly bolted down the highway from Kyneton, met mum and baby at the hospital. The story was so dramatic, it made the Herald Sun. But there is a postscript. Mick, 38, trains 20 horses not far from the Kyneton track. A bit over a week after his third child came into the world on the side of a freeway, Mick took five horses to a meeting at Kyneton that had been transferred from Hanging Rock. One after another at Kyneton, Mick's horses came in. Cashzoo won the first at big odds, then Vopop won the second, Dance Crew the third, Whisky Fur the fourth and Enchanting Waters the sixth, the Hanging Rock Cup. 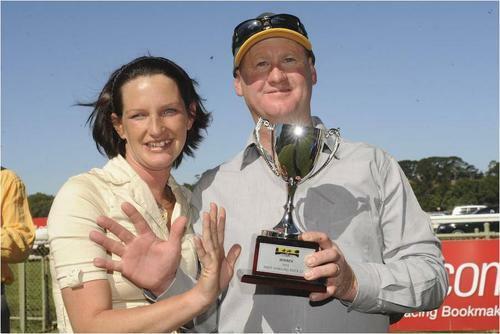 "Two winners in a day is big; five is unbelievable," Mick said. He would have swapped the first four winners if assured Enchanting Waters would win the Cup. Just days earlier, his dad Ron, who part-owned Enchanting Waters, had been diagnosed with cancer. He started chemotherapy two days ago. Enchanting Waters' breeder, Mick's great mate and supporter Maurie Bloom, died on Christmas Eve. "The day probably put smiles on people's faces that maybe needed a cheer up," Mick said. The day after Enchanting Waters won, Mick and Mel visited Ron and presented him with two precious gifts: a granddaughter born on the side of the road and a Cup won by a horse prepared by his son, who'd trained five winners on one day.